'Shagun' Ladies Beauty Parlour, Baroda is a renowned name among the stylish and beautiful ladies. Woman of every age trust the services of Shagun Beauty Parlour as they have a team of professionals who strive to provide the best of services. They specialize in Bridal Hair Style & Bridal Make Up, Hair Styling & Hair Care, Skin Care (Every skin), Spa, Nail Art and Saree Draping. They also provide beauty courses, professional courses, advance courses, full term courses, short term courses, that would equip the people entering this profession with confidence and skill. They have well trained staff to make sure that desired results are achieved. They provide friendly environment and the most hygienic services with utmost care and love. Shagun Beauty Parlour also provides services at your doorsteps in Vadodara. Save time and money by availing parlour-like services at the comfort of your home. Shagun Beauty Parlour is a Bridal Makeup Artist based out of Subhanpura, Baroda . 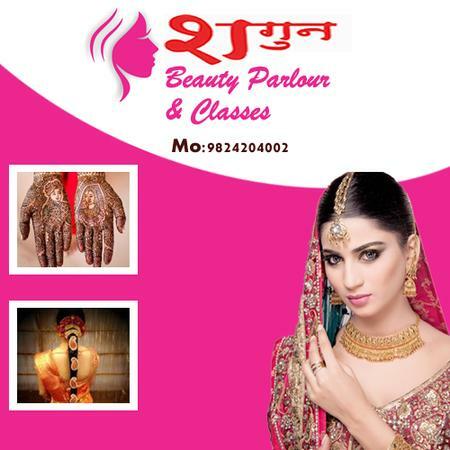 Shagun Beauty Parlour's telephone number is 76-66-77-88-99, Shagun Beauty Parlour website address is http://www.only4lady.com/ladies-beauty-parlour-vadodara/, address is 50, Akashdeep Society Hightantion Road, Near Post Office, Subhanpura. In terms of pricing Shagun Beauty Parlour offers various packages starting at Rs 5000/-. There are 0 albums here at Weddingz -- suggest you have a look. Call weddingz.in to book Shagun Beauty Parlour at guaranteed prices and with peace of mind. Transportation charges included in package when event is in Baroda. Transportation charges included in package when event is outside Baroda.